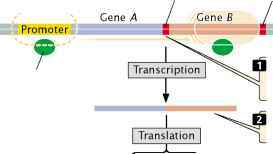 .and transcribes a longer mRNA. .that codes for proteins A and B. 16.19 Antiterminator proteins bind to RNA polymerase and alter its structure so that it ignores certain terminators. RNA polymerase stops at terminator 1. A short mRNA is produced that codes for protein A.
from the histone proteins before transcription can take place. Third, although both repressors and activators function in eukaryotic and bacterial gene regulation, activators seem to be more common in eukaryotic cells. Finally, the regulation of gene expression in eukaryotic cells is characterized by a greater diversity of mechanisms that act at different points in the transfer of information from DNA to protein. Eukaryotic gene regulation is less well understood than bacterial regulation, partly owing to the larger genomes in eukaryotes, their greater sequence complexity, and the difficulty of isolating and manipulating mutations that can be used in the study of gene regulation. Nevertheless, great advances in our understanding of the regulation of eukary-otic genes have been made in recent years, and eukaryotic regulation continues to be one of the cutting-edge areas of research in genetics.